Deccan Odyssey is a luxury train which was launched in the year 2004 as a joint venture between Indian Railways and Maharashtra Government. 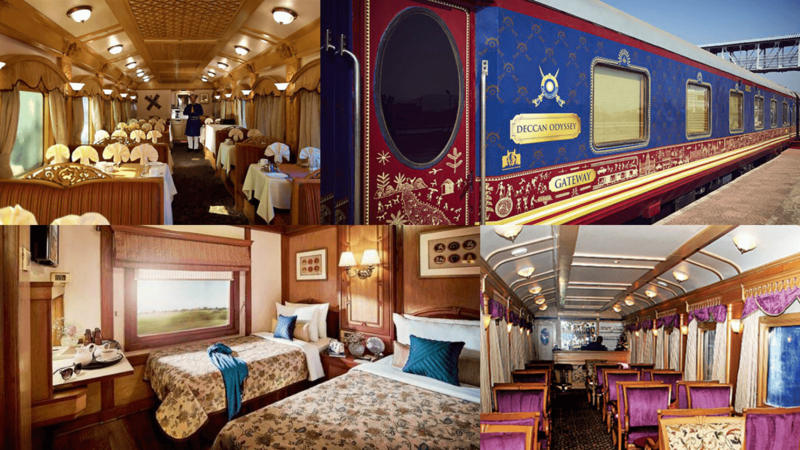 Deccan Odyssey has been designed to mimic the royal carriages of erstwhile Kings of India. The deccan odyssey train has 21 luxurious coaches. Of the 21 coaches, 11 coaches have the passenger cabins while the rest 10 coaches are used as dining, spa, conference and lounge coaches. Each coach has been decorated to represent a specific dynasty which ruled Maharashtra. The guest cabins are lavishly decorated and very spacious. Each cabin has a personal safe, telephone, air conditioning, attached bathroom and personal furniture. A personal attendant is also on call for the guests. The train also has a cozy sitting lounge. Books are also available in the lounge. Peshwa I and Peshwa II are the two multi cuisine restaurants on board Deccan Odyssey. The menu consists of a range of Indian, Continental and Oriental dishes. The royal ambiance of the restaurants and the hospitality of the uniformed stewards make for a memorable dining experience. Conference car on the train is equipped with audio-visual equipments. It is a suitable place for corporate travelers to hold conferences. The spa on board the train offers a plethora of massage and spa therapies based on Ayurveda. The spa is the perfect place for the guests to relax and refresh. 6 routes are offered by deccan odyssey india. They have been listed here. Maharashtra Splendour tour covers Mumbai – Nashik – Aurangabad (Ellora Caves) – Ajanta Caves – Kolhapur – Goa – Sindhudurg. Indian Odyssey tour covers Delhi- Sawai Madhopur – Ranthambore National Park- Agra- Jaipur- Udaipur- Vadodara- Aurangabad- Ellora Caves- Mumbai. Maharashtra Wild Trail tour covers Mumbai – Aurangabad (Ellora Caves) – Pench (Ramtek) – Tadoba – Ajanta – Nashik. The duration of every tour is 7 nights and 8 days. Deluxe cabin for a single occupant is Rs 4,27,000 for Indian nationals and USD $6100 for foreign nationals. For double occupancy deluxe cabins, the fare is Rs 6,12,500 for Indian nationals and USD $8750 for foreign nationals. Presidential suite for both single and double occupancy is Rs 9,24,700 for Indian nationals and USD $13,210 for foreign nationals. Deccan Odyssey is one of the most popular luxury trains in India. Tourists wanting to tour central and southern parts of India in a grand manner prefer this luxury train for the journey. Deccan Odyssey was launched to boost the tourism industry in Maharashtra and has emerged as a major draw for tourists. Some features of deccan odyssey have been mentioned here. Deccan Odyssey has 11 passenger coaches and 2 presidential suites besides eight other coaches for other purposes. Each passenger coach has 4 cabins while each presidential suite has 2 cabins. Washroom is attached to every cabin. The cabins are luxuriously appointed in the manner of palatial accommodations. The design theme of each coach is based on an erstwhile ruling dynasty of Maharashtra. 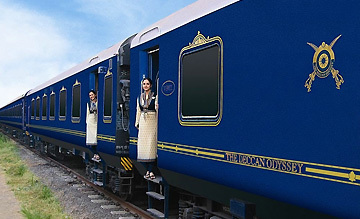 The coaches are blue and gold in colour adorned with Marathi decorative motifs. This imparts a royal look to the train. There are 2 gourmet restaurants in the dining car. Each passenger coach has a lounge with a bar and plasma television for entertainment. There are separate cars for housing a spa, sauna and gymnasium. A conference car is available for holding conferences. It can also turn into a night club. Internet connectivity, intercom and a personal attendant for each cabin are other facilities available on the train. There are six tour plans offered by deccan odyssey India. Here we will discuss the Maharashtra Splendour tour plan. Deccan Odyssey starts from CST station in Mumbai at 3:30 pm. The train reaches Nashik on second day. The tourists explore the Godavari ghat and the vineyards in the city. After an overnight journey, the train reaches Aurangabad. The tourists visit a number of major tourist locations such as Bibi Ka Makbara, Daulatabad Fort, etc. Ellora Caves located 30 km from Aurangabad is next on the list. This is an UNESCO Word Heritage Site dating back to 8th The tourists return to the train after visiting Ellora Caves. Lunch is served on the train. Thereafter, the onward journey commences. On the fourth day, the train reaches Jalgaon. The tourists visit the Ajanta Caves, another UNESCO World Heritage Site. Thereafter, they return to the train for lunch as the train starts its journey to the next destination. Kolhapur is reached on fifth day. There are many places to visit in Kolhapur such as a 19th century palace, 1300 year old Mahalaxmi temple, Town Hall Museum, etc. At the end of the day, the tourists return to the train where dinner is served. Overnight journey commences. Deccan Odyssey reaches Goa on sixth day. There are many things to do in Goa such as visting the ancient churches, lazing on the beaches, watching Goan folk performance, saviouring Goan cuisine, etc. The tourists return to the train at the end of the day for dinner and overnight journey. Sindhudurg is reached on seventh day. This is a holy town which is located on a rocky island on the Arabian sea. The tourists explore the city for the whole day before returning to train in the evening. On the last day, the train reaches CST in the morning.